These two important source books for price and convenience are best purchased through Amazon. Amazon are duty bound to name the Golden Age Project as the source for the O’Brien books. Belief in the one male God of Judaism, Christianity and Islãm can be traced back for something over 2,500 years to the time when the Hebrew scripture of Genesis was compiled in the 6th century BC. The narrative content of Genesis was clearly derived from older traditions but, on the face of it, we have no documentary evidence from any other source of a monotheistic culture in respect of this particular God from before that date. The Origin of God undertakes a biographical exploration of the deiform character variantly known as Yahweh, Allãh, or simply The Lord. It seeks to uncover and evaluate his original identity, as against his eventual religiously motivated portrayals. Then, following the course of his story into biblical scripture, we discover a strategy of pure literary evolution. • If there was nothing before God created everything, then where was God before that? Where did he come from? • If the Bible had never been written, would we know about God from any more original source? • Did the Israelite scribes invent God for some reason, or did they have access to earlier records concerning him? If so, what were they? • So, from where precisely did the Israelites of that era glean their knowledge of events and characters from thousands of years before - events which, following the brief account of God's earthly creation, begin in the book of Genesis with the story of Adam and Eve? • Is there an intelligent, supernatural entity in the universe - or is the concept just an abiding superstition? • The Lord said unto Moses: 'I am El Shaddai, the God of thy father, the God of Abraham, the God of Isaac, and the God of Jacob'. • Who, what and why is God? Who was El Shaddai? When did his tradition begin? How did it evolve? Laurence Gardner's eighth book in well over twenty years of thorough and well referenced research on the many aspects of secular and religious history, challenges what we have been taught about history, science, religion and God. As with his first book Bloodline of the Holy Grail, this book is bound to be a best seller, and will create waves within the rigid established doctrines of those who seek to dominate and control free men and women. This masterpiece completed before his death from a long illness in August 2010, brings together from his and other considerable archives of research and information, the most important story of our incredible ancestors, their advanced civilisation, and the identity of the flesh and blood individual and his family, who led the re-start of civilisation and agriculture. Only after they had disappeared from the Middle Eastern scene were they worshipped in the religious sense; and they were then so enveloped in supernatural trappings that their intrinsic advanced and benevolent characteristics were swamped in a morass of pseudo-religious adulation. 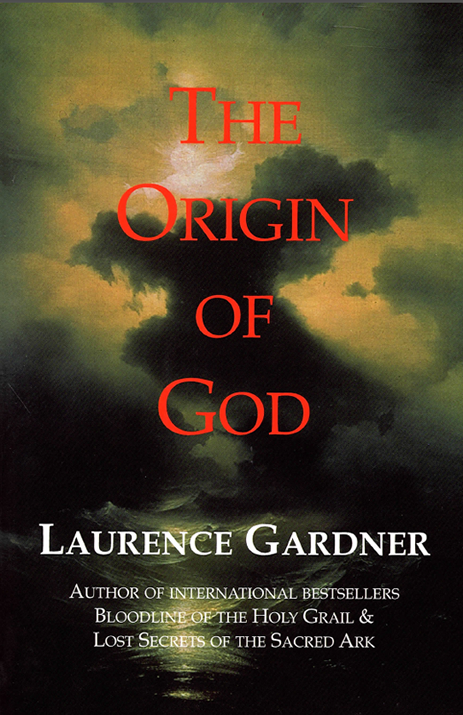 The Origin of God by the late Laurence Gardner is a thought provoking,thoroughly researched masterpiece on a subject that one way or another affects a significant number of people. There are those who will appreciate his efforts to identify the source of the biblical God and there are those who will not. That he made the effort to try to offer an unbiased view should be applauded by all open-minded people. Going back over a period of some 6,000 years, his book's conclusion is that "to believe or not to believe remains a matter of conjecture and personal opinion". Doubtless there will be people who disagree with his conclusions, but before making a judgement this excellent thought-provoking book should be studied in detail. I found Gardner's 'Bloodline of the Holy Grail' fascinating and think that this book is just as thought provoking. It offers an alternative interpretation of events in the Bible and offers explanations for some of the more incongruous occurrences. It seems to be well researched and has plenty of references to follow up on and a good bibliography for anyone who wants to read round the subject matter. Highly Recommended! 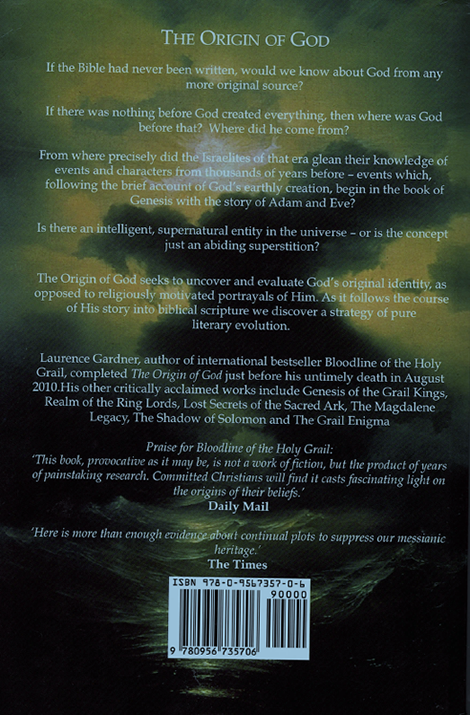 The Origin of God by Laurence Gardner is no ordinary book. In it, he traces the twenty-five-hundred-year-old idea of one God or monotheism back to its original sources in the ancient world, some going back as far as 6,000 years ago. Given the influence of monotheism over the past 2,500 years and the number of people who currently embrace its three great religions in the modern world, this is an important achievement because, as brought out in the book in great and glowing detail, it has only been within the last 100 years or so that these sources -- many going back almost 3,000 years before the time of Moses -- have been known about through recent archaeological discoveries. These sources manage to shed new light on everything, including the idea of one God, and this book shows how. What I particularly like about the book is that Gardner doesn't jump to conclusions. He presents evidence -- and what startling evidence it is! The book is well researched and documented, with extensive Notes and References, and is a treasure trove of further reading, all of it quite academically respectable. It's just that most of its extensive Bibliography is so new to so many that it's like discovering a whole new world within something that everyone thought they already knew. It's an extraordinary achievement and a fitting capstone to his life's work.